The cast of the hit TV series Story of Yanxi Palace <延禧攻略> are the breakout stars of 2018, including 40-year-old Nie Yuan (聂远), who played the Qianlong Emperor. 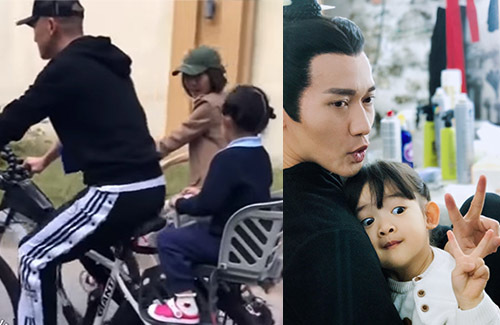 Becoming the paparazzi’s new favorite target, the Yanxi Palace star is also a new favorite guest for talk shows, and in the latest episode of A Date with Luyu <鲁豫有约一日行>, the actor openly talked about his family life, including an endearing habit he has when picking up his daughter from school everyday. The crew of Luyu documented a day in Nie Yuen’s life and followed him to a kindergarten school where he picked his daughter up. Despite being a famous actor and a popular star, Nie Yuen biked to and from school everyday. Netizens were shocked and impressed by Nie Yuen’s modest and down-to-earth lifestyle. “He is so low-profile,” said one. “Yuan Ge is China’s best man,” wrote another. Some even suggested Nie Yuan to consider being a guest on the popular variety show, Where Are We Going, Dad? <爸爸去哪儿>. Are they even filming 爸爸去哪儿 anymore? There wasn’t a season this year….